For the Olympic Nordic skier, see John Berger (cross country skier). 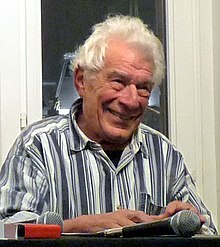 John Peter Berger (born 5 November 1926) is an English art critic, novelist, painter and author. His novel G. won the 1972 Booker Prize, and his essay on art criticism Ways of Seeing, written as an accompaniment to a BBC series, is often used as a college text. Born in Hackney, London, England, Berger was educated at the independent St Edward's School in Oxford. "His father, S.J.D. Berger, O.B.E., M.C., had been an infantry officer on the western front during the First World War". Berger served in the British Army from 1944 to 1946; he then enrolled in the Chelsea School of Art and the Central School of Art in London. Berger began his career as a painter and exhibited work at a number of London galleries in the late 1940s. His art has been exhibited at the Wildenstein, Redfern and Leicester galleries in London. Berger has continued to paint throughout his career. While teaching drawing (from 1948 to 1955), Berger became an art critic, publishing many essays and reviews in the New Statesman. His Marxist humanism and his strongly stated opinions on modern art made him a controversial figure early in his career. He titled an early collection of essays Permanent Red, in part as a statement of political commitment, and later wrote that before the USSR achieved nuclear parity with the US he had felt constrained not to criticize the former's policies; afterwards his attitude toward the Soviet state became considerably more critical. After a childless first marriage, Berger has three children: Jacob, a film director; Katya, a writer and film critic; and Yves, an artist. In 1958 Berger published his first novel, A Painter of Our Time, which tells the story of the disappearance of Janos Lavin, a fictional exiled Hungarian painter, and his diary's discovery by an art critic friend called John. The book's political currency and detailed description of an artist's working process led to some readers mistaking it for a true story. After being available for a month, the work was withdrawn by the publisher, under pressure from the Congress for Cultural Freedom . The novels immediately succeeding A Painter of Our Time were The Foot of Clive and Corker's Freedom; both presented an urban English life of alienation and melancholy. In 1962 Berger's distaste for life in Britain drove him into a voluntary exile in France. In 1972 the BBC broadcast his television series Ways of Seeing and published its companion text, an introduction to the study of images. The work was in part derived from Walter Benjamin's essay The Work of Art in the Age of Mechanical Reproduction. His novel G., a romantic picaresque set in Europe in 1898, won both the James Tait Black Memorial Prize and the Booker Prize in 1972. When accepting the Booker Berger made a point of donating half his cash prize to the Black Panther Party in Britain, and retaining half to support his work on the study of migrant workers that became A Seventh Man, insisting on both as necessary parts of his political struggle. Many of his texts, from sociological studies to fiction and poetry, deal with experience. Berger's sociological writings include A Fortunate Man: The Story of a Country Doctor (1967) and A Seventh Man: Migrant Workers in Europe (1975). His research for A Seventh Man led to an interest in the world which migrant workers had left behind: isolated rural communities. It was his work on this theme that led him to settle in Quincy, a small village in the Haute-Savoie, where he has lived and farmed since the mid-1970s. Berger and photographer Jean Mohr, his frequent collaborator, seek to document and to understand intimately the lived experiences of their peasant subjects. Their subsequent book Another Way of Telling discusses and illustrates their documentary technique and treats the theory of photography both through Berger's essays and Mohr's photographs. His studies of single artists include most prominently The Success and Failure of Picasso (1965), a survey of the modernist's career; and Art and Revolution: Ernst Neizvestny, Endurance, and the Role of the Artist, on the Soviet dissident sculptor's aesthetic and political contributions. In the 1970s Berger collaborated with the Swiss director Alain Tanner on several films; he wrote or co-wrote La Salamandre (1971), The Middle of the World (1974) and Jonah who will be 25 in the year 2000 (1976). His major fictional work of the 1980s, the trilogy Into Their Labours (made up of the novels Pig Earth, Once in Europa, and Lilac and Flag), treats the European peasant experience from its farming roots into contemporary economic and political displacement and urban poverty. In recent essays Berger has written about photography, art, politics, and memory; he published in The Shape of a Pocket a correspondence with Subcomandante Marcos, and written short stories appearing in the Threepenny Review and The New Yorker. His sole volume of poetry is Pages of the Wound, though other volumes such as the theoretical essay And Our Faces, My Heart, Brief as Photos contain poetry as well as prose. His recent novels include To the Wedding, a love story dealing with the AIDS crisis stemming from his own familial experience, and King: A Street Story, a novel on homeless and shantytown life told from the perspective of a street dog. Berger initially insisted that his name be kept off the cover and title page of King, wanting the novel to be received on its own merits. Berger's 1980 volume About Looking includes an influential chapter, "Why Look at Animals?" It is cited by numerous scholars in the interdisciplinary field of Animal Studies, a group that seeks broadly to consider human-animal relations and the cultural construction of terms like 'human,' 'animal' and so on. Collectively they took Berger's question to mean that scholars are surrounded by animals but often do not actually see them, and that there are good theoretical and ethical reasons to study animals in the humanities. Berger's most recent novel, From A to X, was longlisted for the 2008 Booker Prize; Berger and Salman Rushdie were the only former winners to be nominated in that year. ^ McNay, Michael (24 November 1972). "Berger turns tables on Booker". The Guardian. http://www.guardian.co.uk/news/1972/nov/24/mainsection.fromthearchive. Retrieved 5 December 2009. ^ Christian Dimitriu, Alain Tanner, Paris: Henri Veyrier, 1985, pp. 125-134. "A radical returns". The Guardian April 3, 2005. Bloomsbury Author Page features biography and bibliography. Interview by Victoria Brittain about John Berger's most recent book "From A to X: a Story in Letters" . – Awarded in 2010 as the Lost Man Booker Prize, due to a change in the contest rules.